Leftover cooked chicken turns magically into another easy Southern favorite. This spicy dish can put a kick in your step. Serve over rice. 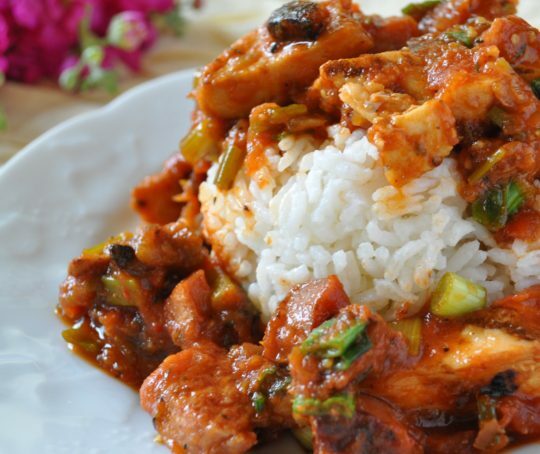 Make your jambalaya spicier with pre-cooked chicken breasts straight from the freezer. This recipe is featured in Holly Clegg's Too Hot in the Kitchen: Secrets to Sizzle at Any Age. In large nonstick skillet, cook sausage over medium heat until done. Drain any excess grease. Add chicken, salsa and thyme. Bring to a boil, reduce heat, and add green onions, cooking 5 minutes longer. Baker’s Tip: Pick up frozen pre-cooked, grilled sliced chicken breast fillets for grilled flavor.